I was ordering food at one of the food stalls over at Trinoma and while waiting for my food to be served, I happened to notice their humungous rice cooker. 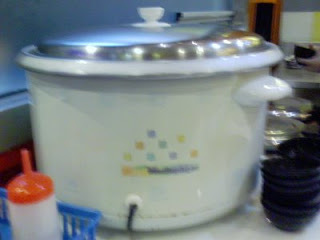 I was astonished when I saw the huge rice cooker and was thinking how many cups of rice can that baby produce. That was until I saw what was labelled on the side. 3D, Hanabihisi, Kyowa and the rest of the rice cookers, move over. 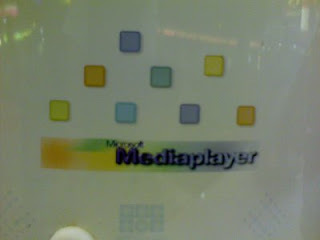 It's powered by Microsoft and it says it's also equipped with Microsoft Media Player. LOL! If it only had an SD card slot so I can listen to my MP3s while waiting for rice to be cooked! Now that's steaming hot ! hahaha! I wonder if I'm going to find this brand of rice cooker in our future kitchen? Hehhehe. koya, saan saan ka ba pumupunta at kung ano ano nakikita mong kakaiba! @Aileen pwede naman tayo magattach ng maliit na mp3 player sa cord ng ricecooker...kunwari multimedia siya. mahirap sa mismong lutuan, baka masizzle ang circuits. @Migs sama ka saken minsan... kahit normal, tingin ko sa mga bagay minsan kakaiba eh. LOL!